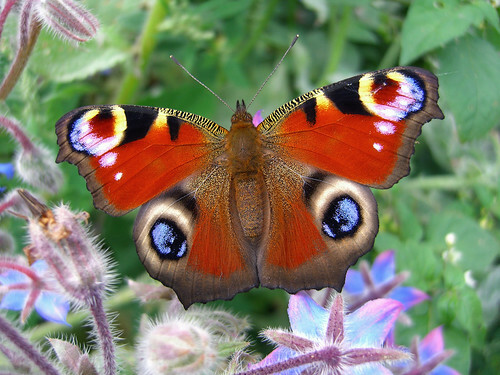 We spotted our first Peacock butterfly of the year on the 15th March, which, unsurprisingly, was also the first properly warm spring day. The pic above is from Paul's archive and shows a splendid late summer example. It really is a genuine snap despite the unrealness of its perfection. Rootstocks have arrived, rather late in the season, so I've potted them up so they're not checked when we can eventually get them to France and plant them out. The plan is to take grafts from several of the existing and close to expiration cider apple trees to secure their future while we try to work out what varieties they are. It's also going to be quite a learning curve for me; I have all the theory and none of the practice required for this sort of work. I'm hoping beginner's luck will carry me through. We also bought three pear root stocks so that the same exercise can be carried out on the wonderful but sadly neglected eating pears on the walls of the cider house. Seed Swappers: I think I've now tracked down everyone who mailed just before and during my recent computer crisis. You should have received email and will, I hope, soon receive your swaps. If anyone thinks I've missed them please write NOW. I will be closing the list for the summer on the 1st April. And finally, kittens are fine, fat and furry. 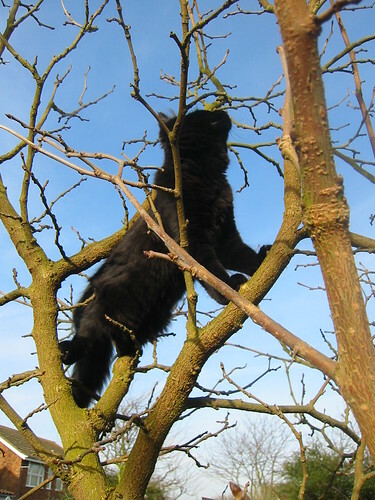 I'll do another kitten diary post to cover all the twee details and spare the feelings of readers who are less interested in small beasts but here is a picture of Raven climbing the mulberry tree. She seems to have a natural climbing ability that far outstrips her brothers. don't tell joker but i think the kitties are lovely! and thank you for the red bean seeds!